What comes to mind when you think about the UW? Students engaged in discussion in a classroom? The view from Rainier Vista? Medical students at a rural health clinic? An innovative high-tech lab? The thrill of a football game in fall? Everyone has a different perception of the UW. Together, these perceptions form our brand. At its core, our brand is our reputation. It represents who we are as a university and stands for our aspirational goals and ideals. It embodies our values as perceived by the general public, our students, our faculty and staff, our alumni and our friends. So what about brand marketing? Brand marketing is when we demonstrate the UW’s ideals and values in a compelling way to achieve specific objectives. It is a unified strategy that informs all levels of organizational planning and communications by compelling the organization to achieve at the highest level and to meet our own universally understood standards. Through our integrated brand marketing strategy, we seek to systematically engage our audiences with a cohesive message about who we are and what we represent. By presenting our brand consistently, we can positively influence how people think and feel about the UW. And that means we can amplify our potential impact, whether by raising more money to support student scholarships and programs, recruiting more high-achieving students and top faculty or securing new research dollars. Our brand is very much alive, and it’s in your hands. Everything you say and do on behalf of the UW is part of that living brand. By using a consistent visual style and voice, we can convey our messages more clearly, ultimately helping us touch more lives. Our brand strategy is built upon a strategic framework — our brand pyramid. The brand pyramid is an internal strategic framework that we build upon in all of our marketing and communications. When we use the brand pyramid as a guide, it helps unify our brand, differentiate us from other universities and solidify our audience’s understanding of our values. Before we can implement this strategy, we must be clear about what audiences we want to engage. When considering the students who will excel here, the traits of faculty and staff who will inspire and encourage those students, and the characteristics of the countless others who make up our community, we can identify core elements that represent who we’re for. We’re for people who think about the greater good. We’re for people who believe anything’s possible. We’re for people who are achievers, collaborators and self-starters. We’re for people who embody real-world authenticity. And we’re for people who are determined change creators. 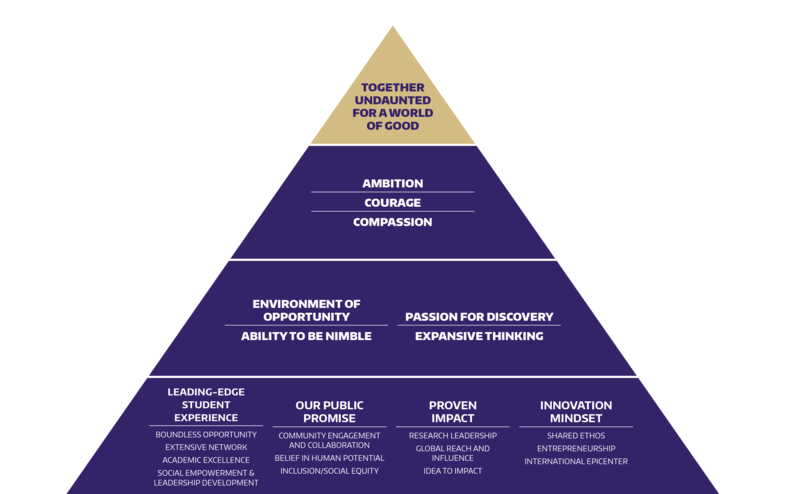 We’re a community that can inspire powerful change, and we invite others who personify these traits to become active members of the UW community, too. Our brand promise is our internal North Star. It is a succinct summation that captures the essence of who we are as a university and what we stand for as a university. As you craft communications and engage audiences in conversations about the UW, our brand promise acts as a compass. It is not a public-facing statement to be used verbatim; rather, it helps us gauge how our messaging and interactions fit into the larger picture of the University. It is the pivot point of our strategy. Our brand promise was developed through collaboration with people from all facets of the UW. An understanding of the world’s interconnectedness binds us to the community and to each other. Through the shared pursuit of discovery, we believe we can fully realize our potential, both individually and collectively. We’re renowned for our interdisciplinary approach, our deep connections to the community, and our global partnerships and collaborations. Most importantly, we know that by working together we can magnify our impact. We understand that tackling big challenges requires tenacity, confidence and a stalwart belief in what’s possible. We also know that innovation takes trial and error. We’re driven to confront challenges head-on, to see the big picture and to push the boundaries for the sake of a better world. We are determined, ambitious, inventive and willing to work hard. We change lives. Our impact on the world is real, and making a positive difference is what propels us. We believe the pursuit of knowledge is a noble endeavor. And because we are passionate about humanity’s progress and improving our communities — whether those communities are across the street or around the globe — we use that knowledge to inspire action and unleash people’s full potential. How do we bring our boundless spirit to life? Through the stories we tell and how we tell them. In the ways we link belief and impact. And, in our brand elements — from our design system, to type, to our visual identity. Check out the UW brand style guide PDF (Note: the UW brand style guide is being edited and is not currently available) a complete overview of the brand system. Visit editorial to learn more about telling our stories. Dig through graphics to learn how to visually bring Boundless to life. Do-it-yourself with templates. Go digital in web, email and social. Download the brand poster for your desk!